Frogs are definite favourites of Julia Donaldson and Axel Scheffler. They’re in the background in several scenes in The Gruffalo, while one individual takes a starring role in Room on the Broom as a hitch-hiker picked up by the Witch and her cat. That’s fair enough – they’re a common beasts in Britain, even if the nearest some people come to them is squished corpses on the road showing that a few hundred million years of evolution is no match for the internal combustion engine allied to four wheels. But they can be hard to find alive and well. They either hang out in dank, smelly (well, ours is) ponds, log piles or some dark corner of a satisfyingly moist cellar, and most normal people tend not to go poking around these sorts of spots in search of wildlife. It’s not very glamorous – it’s hardly stalking lions and leopards on the African savannah. But frogs have one amazing quality that even the apex predators of the Serengeti cannot match – they undergo metamorphosis, turning from tadpoles into froglets over the space of a few, surprisingly short weeks. So, when I started thinking about an adventure Sam and Mungo could have with frogs, I quickly realised that rather going bog-snorkelling in a remote corner of Herefordshire, I’d be better off popping into Wilko’s and buying a small, plastic aquarium and some fish flakes for a fiver. And then finding some frogspawn. 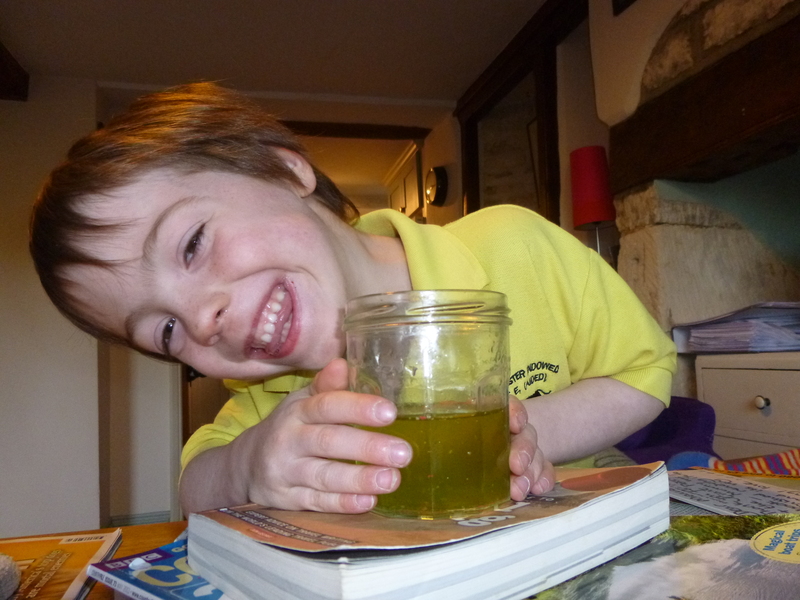 So, that’s what I did, and when I returned to the house with my Wilko’s tank full of slightly murky pond water and the frogspawn, Sam’s curiousity was definitely piqued. “What are you doing, Daddy?” he asked. I explained (as I have done before) how the funny mushy stuff that looked a bit like tapioca (something, in fact, we’ve never inflicted on our children) was going to turn into tadpoles which would then turn into tiny frogs, thinking it would set off a whole raft of questions about the wonders of nature, life and the universe. Instead, I was met with a rather blank look. “Oh,” he said. And for a while, Sam ignored the aquarium. Tadpoles are really very small when they first hatch (I still can’t decide whether ‘hatch’ is really the appropriate word to use here), and quite difficult to see for a five-year-old, I think. Indeed, initially the only topic of conversation they prompted was whether they were getting enough fish flakes. I said they were, Louise was less sure. 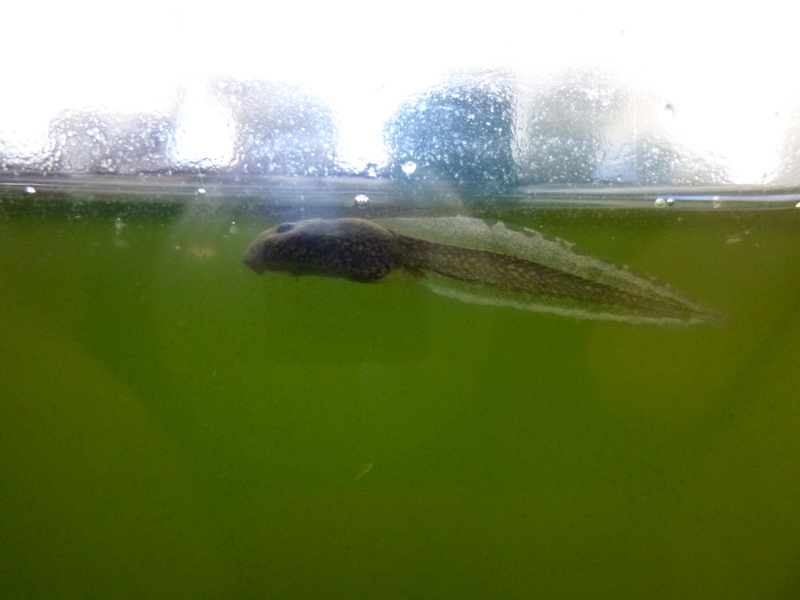 Tadpoles mostly eat algae off the sides of the tank, in any case, so I’m not entirely convinced they were necessary. But the tadpoles did grow, and at some point when their little heads started to broaden out so that they no longer looked like they should be swimming up a fallopian tube, Sam started to take an interest in them. I don’t think he could quite make out the tiny front legs – and they really were tiny, as proportionately minute as T. Rex’s – but every few days, he asked to have a look at them. Now, they were changing almost day by day, with back legs appearing as if from nowhere, so that they were now truly a very strange sort of hybrid. Then, one day, I got home, and Louise said that some of them had lost their tails and were trying to get out. 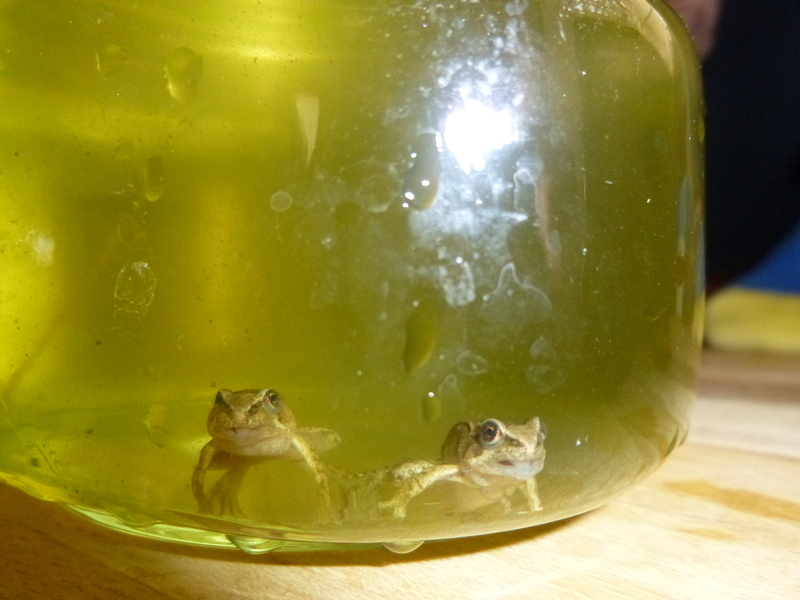 They were froglets, it was time to let them go. I transferred a batch to a glass jar, took a few pictures with Sam gurning into the camera, then we headed down to the pond with our precious beasts. I carefully poured them out onto a small patch of visible pond liner, and we both watched as the froglets – which really were no bigger than the nail on my little finger – looked around at their new surroundings, decided they liked the look of this new-found freedom and then took a prodigious leap into the balmy waters of the pond, never to be seen again – not by us, at any rate. The chances are that they didn’t spend long in the pond. Their instinct would have been to disperse to one of those dark, dank areas I was talking about earlier, where the odds are they will have been eaten by a garden bird, a hedgehog (not that we have many of those), or even a fox, a badger or a grass snake. According to some information I found online, only five frogs will reach adulthood from a batch of 2,000 eggs (which is the average number in a normal-sized clump of frogspawn), though because tadpoles are predated – by dragonfly nymphs – I like to think I have at least marginally improved their chances of breeding themselves in about three years’ time. It was a triumph. There was a minor failure with the toadspawn, which turned into a dead mush just a few days after I fished it out of the pond, but I didn’t draw Sam’s attention to this. The first thing you need is your own pond (or, at a push, a neighbour’s). I’m sure you know what frogspawn looks like, but toadspawn is quite different – long, dark threads of eggs that are wrapped around pond plants. Frogspawn can be laid as early as January or February, but this year (in South Gloucestershire), ours didn’t appear until mid-April. Indeed, I thought our frogs had failed in the romance stakes this year because it appeared so late (it was a very cold spring, remember). Wilkinson’s does perfectly suitable plastic tanks for £5. On the advice of a friend, I bought some fish flakes, but I’m not sure they were necessary. Fill the tank with water from the pond (not tap water, which is chlorinated), then put in a smallish clump of the frogspawn. 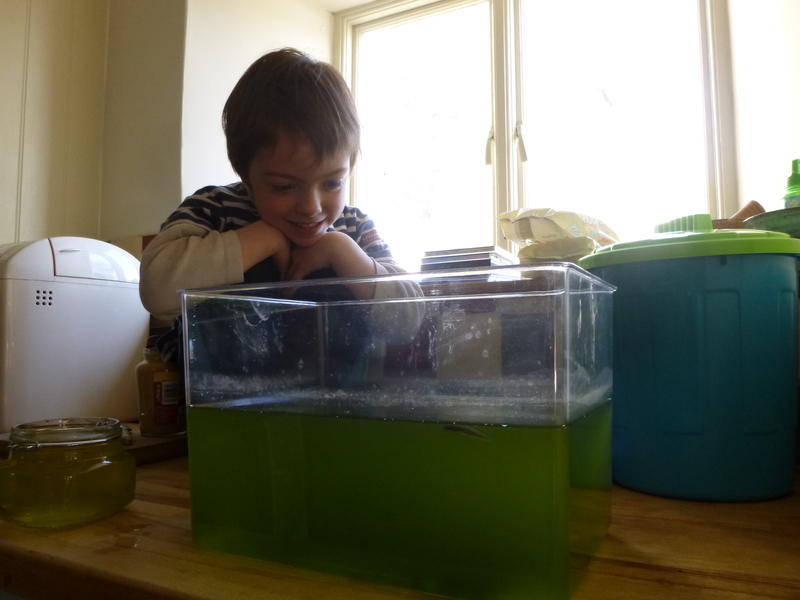 There’s no point in putting in too much, you don’t want too many tadpoles. 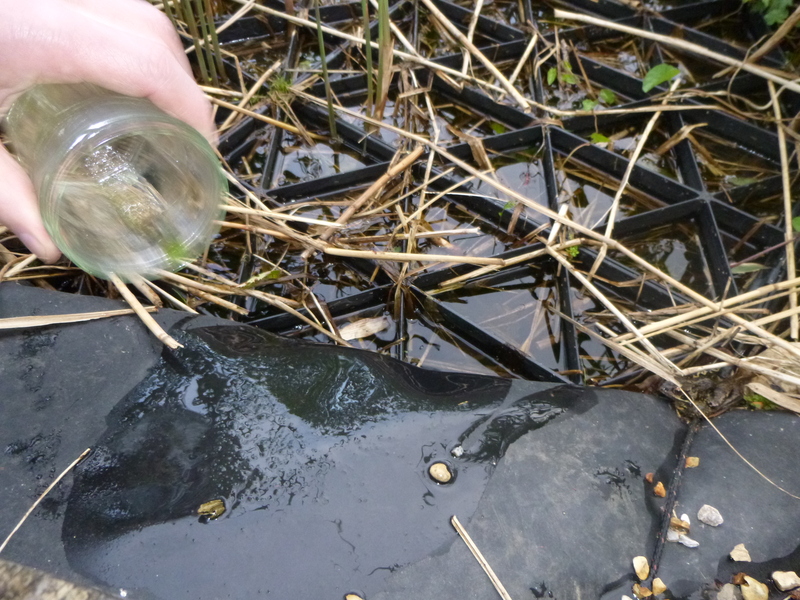 Put the froglets back where you got them from. Don’t take them to a different location, because it could potentially lead to spreading unwanted diseases. If you decide to release them into undergrowth rather than into your pond, do it at night when they will be less at risk from predators.